Wonderful close up!! Boom & Gary of the Vermilon River, Canada. Nice color and background bokeh Pat. This is a great image but then, you have many fantastic wildlife images here on your site. Very good composition, great work! I love those cool colors Pat. You were rewarded for your great patients hanging in there till the last second as the sun set on your shoot. You highlight this bird beautifully! Wow-that is a stunning shot! The composition and lighting are perfect. Beautiful photo. That's a shorebird we don't see down here in Australia. A lovely image of a beautiful bird. Amazing close-up on this plover, with a fantastic light and perfect dof ! Great job ! Patience as always paid off Pat. Superb compostion and detail in that cool blue light. Beautiful bird and image. Well done! Thats another really good shot. Enough said. Lovely image! Great colors and detail! A very beautiful photo. Really a good shot. Bravo! Lovely image, Pat. And great patience to capture it. Beautiful photo ... great lighting. 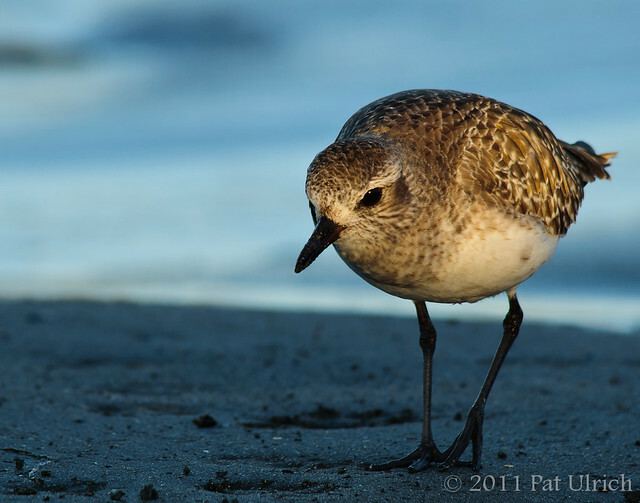 This is an exceptional photo of the Black-bellied Plover Pat. The patience and persistence it takes to get a shot like this is worth it though isn't it? Not only are the colors fantastic, the depth of field and the lighting are perfect. The most important thing to me though, and what makes this photo what it is, is the angle you took, getting down on the sand to make it the perfect shot!